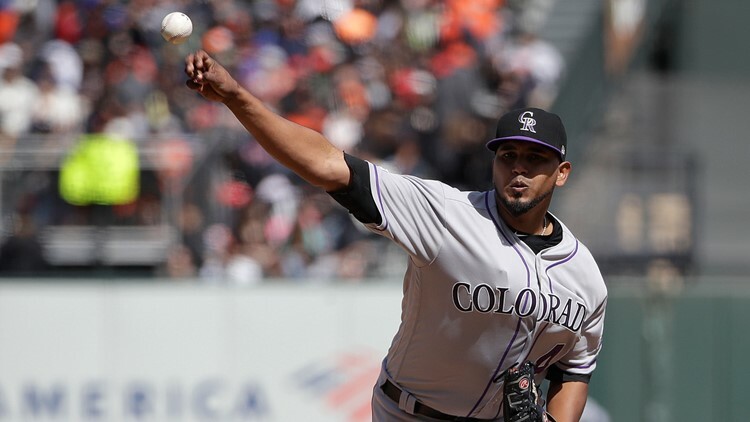 The Rockies finally get a win against the San Francisco Giants after eight straight loses. Marquez (2-1) struck out nine and walked none while throwing 105 pitches in the first complete game in the majors this season. It was the first-ever complete game for Marquez in 156 pro starts, including 69 in the big leagues. Marquez had allowed just one runner, hitting Kevin Pillar with a pitch to begin the sixth inning, and was in complete control heading into the eighth. Longoria followed with a grounder in the hole, just beyond Arenado's dive. The Gold Glover took off his mitt and slammed it to the ground, shouting in frustration that the no-hit bid had been broken up. Arenado walked and scored on Story's RBI double in the third. Arenado then ended his power drought with a towering home run off Giants starter Derek Holland in the fifth. Rockies: Kyle Freeland checked out fine a day after developing a blister on his left middle finger. Manager Bud Black doesn't expect Freeland to miss his next turn in the rotation. Giants: OF/1B Tyler Austin underwent an MRI on his right elbow after injuring it during a pre-game workout earlier in the week. Although the test came back negative, Austin could still be placed on the injured list. Catcher Aramis Garcia has been placed on the taxi squad in case the team makes a move with Austin. Rockies: Manager Bud Black has yet to name a starter for Monday's game at San Diego. RHP Antonio Senzatella, who rejoined the team in San Francisco after completing a rehab assignment in the minors, is the leading candidate. Giants: RHP Dereck Rodriguez (1-2, 4.15) faces the Nationals and ace Stephen Strasburg in the opener of a three-game series in Washington on Monday.